Splashpower has developed a new way of powering devices based on wireless power. You can power up any Splashpower-enabled device (e.g. 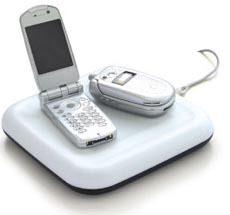 phone, PDA, MP3 player, camera etc), simply by dropping it on a mouse-mat-sized pad. No physical connection is required between the SplashPad and the device. Power is transferred wirelessly between the pad and the receiver module in the device. And of course, different devices can be charged on a single SplashPad at the same time. I want one but i hate charging my phone, how lazy are we becoming people!